Which kinds of animals have fur and how does fur help them? What's the oldest living thing on land? How did zebras get their stripes? What's the hardest rock on Earth? How many bones are in your foot? Where are dinosaur fossils found? Why do some deep sea fish have glowing body parts? Can a plant fold up its own leaves? Scroll down to find the video and click on the play button. Why do pink flamingos stand on one leg? Are all cheetahs born with spots? What's in the mystery photo? A tooth? Animal skin? Click on "find out". To guess again, click on a photo next to "try another!" Why do spiders make webs? Where do clouds come from? And how many leaves does a tree have? 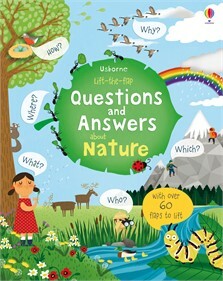 Inquisitive young children can discover the answers to these questions and many more in this beautifully illustrated information book, containing over 60 flaps to lift. A fascinating introduction to the natural world.